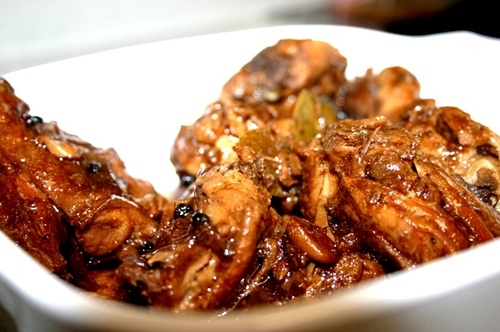 Chicken adobo is another favorite. The “adobo” dish comes from the Spanish word for a marinade. Filipinos love to cook up something new from what’s ordinary. The vinegar marinade,especially the native vinegar, makes the dish so tasty and delicious. For a tasty marinade, add the chicken pieces, vinegar, soy sauce, onion, garlic, bay leaf, peppercorns and salt to a large, non-reactive bowl. Refrigerate for 1-4 hours. Put the chicken and its marinade in a large pot. Add the water and bring to a boil over medium-high heat. Reduce heat to low and simmer for 30-45 minutes, or until the chicken is cooked through and tender. Add water as necessary to keep the chicken from drying out. Remove the chicken from its sauce, reserving the sauce, and pat dry. Heat the oil in a skillet over medium-high flame and sauté the chicken pieces to brown them. Remove from heat and set aside. Bring the sauce to a boil over medium flame and cook until somewhat reduced and thickened. Toss the browned chicken pieces with the reduced sauce and serve with steaming hot rice.